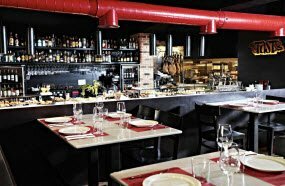 Tast is a rustic restaurant focusing on “tasting tapas”, however they do not limit themselves to tapas, also serving salads and steaks as well as a wide variety of cheeses, bruschetta and an impressive wine menu. Must Try Dishes: For the real flavor of Spain, try the local Iberian Ham (Jamon Iberico De Bellota) as a tapas. Jamon is at the heart of the Spanish culture and life, with most Spaniards eating it at least once a day. The Ham will be sliced off the bone while you wait, guaranteeing fresh, quality ham at a reasonable price. The modern and chic Simply Fosh serves Mediterranean dishes with a contemporary twist, using only ingredients sourced at local markets. Your fine-dining experience takes place in a 17th century building and provides an unforgettable dining experience. Must Try Dishes: Whilst in Spain you must try gazpacho, a local dish. Luckily, Simply Fosh offers a mouth watering Chilled Fresh Pea & Borage Gazpacho served with Redcurrants and Goats Cheese Ice-cream. This modern twist on the classic gazpacho will have you craving seconds. 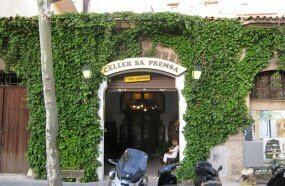 Celler Sa Premsa, whom are about to celebrate their 60th anniversary, pride themselves on their rustic atmosphere and Majorcan cuisine. 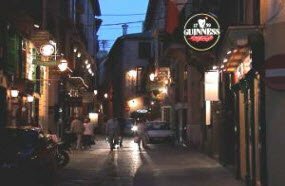 You will be eating in a very traditional restaurant, with frescos on the walls and a heavy focus on timber furniture and roof paneling. Must Try Dishes: Arroz Con Leche, or Rice Pudding, is a typical dessert at the heart of Spanish cuisine. Slightly different from the traditional rice pudding, the Spanish version – what you will be served here – has a thicker consistency, does not contain raisins, instead a lot more cinnamon is used, which complements the rice perfectly. If you’re passionate about wine, we have found your Heaven! 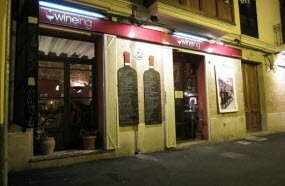 Wineing offers 48 types of wine which you dispense yourself by placing a card, you are given upon entering, into the machine, selecting whether you want a sample, half or full glass or entire bottle, then at the end you pay for what you have taken. The elegant atmosphere teamed with great food will provide you with a truly unforgettable experience. 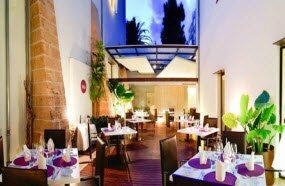 Must Try Drinks: For a local experience, try some La Tierra de Mallorca, a lovely area for growing wine in Palma. Both red and wine whites are available. Bar Abaco is truly a one of a kind. Located in a restored 17th century Baroque house lies an elegant and sophisticated modern-day bar. The property is still set up and furnished as if it were a lived-in house, with new flowers and fruit arrangements being set up regularly. Guests are free to explore the amazing bar which also features an outdoor courtyard with water feature; a true oasis. Must Try Drinks: The extensive cocktail list may leave you a bit overwhelmed, so we recommend trying the Margarita. Whilst technically Mexican, Margarita’s are extremely popular with Spanish locals and have been in the country for over 50 years. Chakrais most definitely Palma’s most colourful and eclectic bar. 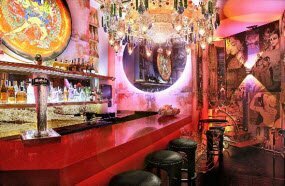 The Indian-style bar is heavily decorated with Indian furnishings, chandeliers and wall-art and the waiters wear traditional Indian clothing, such as belly-dance costumes for an extremely authentic feeling that will transport you from Palma to Delhi. Must Try Drinks: For an interesting combination of cultural flavours, try the Punjabi Sangria, containing an orange liquor, mango and prosecco.